One would think that last week’s passage of the Republican version of the American Healthcare Act, the bill to “repeal and replace” Obamacare, would be met with jubilation on the right. Instead it’s been met with a mostly “meh” attitude. Unlike Obamacare, which Democratic activists enthusiastically defended every step of the way, Republican activists aren’t happy with this bill. When the bill is taken up in the Senate, they are likely to be even less happy. Probably the only positive feature that Republicans will agree on is that it’s likely to be better than Obamacare. Ends the mandates and tax penalties of Obamacare. Blocks Planned Parenthood payments for one (?) year. Stops and begins the rollback of the Medicaid expansion. Changes Medicaid from an entitlement to a block grant. 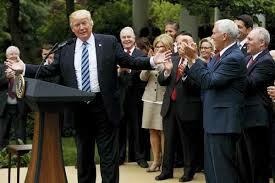 If, through some miracle, this bill were to sail through the senate unscathed, and become law as currently written, it would destroy healthcare in this country and do to Republicans what Obamacare did to Democrats; Reduce their numbers to a shrill minority in the House and Senate and forfeit the Presidency to the Democrats for the foreseeable future. Why am I so glum about the results of the bill? Changing the subsidy to a tax credit is a positive step, one that Republicans have supported for years, but the range of tax credits, $2,000 to $4,000, and the method of doling them out, is a disaster. First, the tax credit amounts are ridiculously low. John McCain’s 2008 health reform plan was better than that, and I thought that was a bit low at the time; $5000 for families and $2,500 for individuals. Also, the amounts are more based on age rather than income. There may be a rationale for that, but the Republicans in the House have not attempted to explain why basing tax credits on age will be more helpful to people than basing them on income. The average family employer insurance plan cost for 2015 was $ 17,322.00. To buy an equivalent plan on the individual insurance market, the tax credit should be anywhere from a third to half of that (to provide somewhat equal equivalence to the employee cost that employer plans have); way more than the Republican bill is offering. The other issue is Medicaid. Changing Medicaid from an entitlement to a block grant is probably the single most important long term feature of this bill, and one that does the longest term good. However, depending on where you get your estimates, more than 84% of the increase in health insurance coverage is due to Obamacare’s increase in Medicaid expansion coverage. That’s coverage that, to the recipient, is free, with no premiums or co-pays. Almost 12 million people will lose the Medicaid Expansion coverage over time. To offer them a replacement of a $2, 000 tax credit (with no mandate to force coverage) will leave a result that almost all of those people will lose coverage and not get a replacement plan. So if you have a pre-existing condition, your health care costs are likely to go up, even though you’ll still be able to purchase insurance. We are currently in an Obamacare death spiral; a death spiral which probably represents a good portion of the Obamacare exchange market. Next year it will be worse. So in this way at least, things are likely to continue under the House bill the same way they are currently under Obamacare-higher prices and fewer choices. So to summarize, the House bill is an unworkable mess as currently written and is less a repeal and replace than an optional opt out of Obamacare, while taking away the features of Obamacare. So Congress is keeping the Obamacare rules and regulations, but taking away the features that made them workable. States can opt out of those requirements, but Medicaid Expansion is going away anyway. If you have a pre-existing condition, you may be no worse off, but certainly no better, than if we do nothing and let Obamacare death spiral into the ground. Ultimately, none of this will probably matter. The Senate is likely to so alter the bill that it will be unrecognizable. But the struggle and fight over the House bill is a precursor to the fight in the Senate.